With the addition of a fantastic second course in 2006, El Rompido is now one of the most outstanding golf resorts in Western Andalucia. Located in the stunning natural environment of the Marismas del Rio Piedras, a vast natural park situated around the mouth of the estuary, both the North and the South courses are first-class layouts, offering exciting play with great views. With easy access from Faro International Airport, around a 60-minute drive away, El Rompido is a superb option for a golf holiday in Spain within a picturesque setting. Benefiting from the glorious weather of Southwest Spain, both the resort and the local beaches can be enjoyed year-round. The hotel at El Rompido is nothing short of spectacular, 5-star luxury throughout, guests can enjoy the range of world-class facilities available on-site. The South Course borders El Rompido's clubhouse, and comprises two distinct loops of nine holes which together are a testing 6,723-yard championship test. The course's layout is carved from the pine and olive trees, and marshland that make the landscape so special. With its spectacular Atlantic backdrop, the South Course at El Rompido makes for a truly special golfing experience. The inception of the North Course in 2006 confirmed El Rompido's position as one of the region's golfing leaders, and is well worth a stop during your golf holiday in Andalucia. At 6,665 yards, the North is slightly shorter than its neighbour, and will demand high quality ball striking in order to score well. The course's raised position affords golfers amazing views over the Atlantic coastline and the pine trees and marshland of the nature reserve, helping to embellish the overall golfing experience at El Rompido. Both the North and South Courses have their own extensive practice ranges that are designed by golf professionals to offer the best practice facilities. 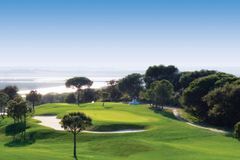 Set within mature pine and orange groves, El Rompido offers a picturesque golfing layout with superb views across the Atlantic Ocean on both the front and back nines. El Rompido golf resort is at the cutting edge of the Costa De La Luz’s emergence as a serious golf holiday destination, which has much to do with its excellent 5* hotel. Perched on the magnificent unspoiled Huelva coastline, El Rompido is wedged between the ever-popular hot spots of the Algarve and the Costa Del Sol. Hotel guests will choose from the resort’s total of 196 superbly appointed bedrooms and suites, all of which are decorated in a lovely contemporary fashion. Complementing the outstanding views of the fantastic Huelva landscape, the rooms and suites are complete with convenient features such as deluxe bathrooms, full air-conditioning, satellite television, mini-bar, safe deposit box and private balcony or terrace. El Rompido typifies the striking development of the Costa De La Luz, which has become a serious alternative to the most popular golf holiday options in Spain or Portugal, and with two championship courses on site, it is superbly equipped for a fantastic escape to the Spanish sunshine. Guests at El Rompido will enjoy cooling off in the indoor and outdoor swimming pools, while the nearby beaches are absolutely stunning. In the leisure complex, the excellent facilities include jacuzzis, a sauna, steam room and tennis courts, as well as a well equipped gym. With golf and sea views available from the hotel, El Rompido is a picture perfect getaway that is popular with groups, couples and singles alike. The Precise Resort in El Rompido is advertised as 5 star accommodation, however, it is at best a 4 star. The staff are pleasant and the hotel is clean, but, the bedrooms and bathrooms are in need of an update. The buffet area in the dining room, for breakfast and evening meal, is inadequate for the amount of people, it has a very limited choice and frequently runs out with slow replenishment. The hotel also had an unusual policy of selling fruit at breakfast, i.e. bananas, apples, oranges etc. Several areas outside were being made ready for the ‘busy time’, ie, the decking and outside swimming pool, which we were told started in April. The indoor swimming pool incurred a cost of €3 for a ‘swimming hat and towel’. When you have already paid for the hotel, the purchase of fruit and extra charges for the pool, were slightly annoying. The weather was above average for our trip, however, there was no air conditioning, the reception staff stated that only the heating had been connected! The two golf courses were in very good condition and compliments to the green keepers. Very comfortable room and good housekeeping. Staff are pleasant and helpful. It is a small hotel with one bar and a restaurant. The food is good but choice is limited. Overall it was a good experience and we will return there for more golf. Very good buffet clean rooms good views. Not quite as good as previous years. Changes to the bar/restaurant drinks policy was disappointing. I was really impressed by El Rompido, it was the first time we've visited this area and will certainly be going back next year. The courses were perfect for us and very picturesque down by the water. I preferred the south course, the views across the Natural Parkland is picturesque. Like the north course, you will loose your ball if you fail to keep it on the fairway. Greens and condition of the course was very good. The north course is not as picturesque as the south, however it can be challenging if the ball is not placed accurately. The condition on both courses is excellent and the greens are in very good condition. Slightly more difficult than the South course but again a nice layout with good greens and views. Overall both course are a fair test of a golfers abilities and enjoyable experience. Good variety of holes and not too long with great views over the nature reserve. Very busy course but still managed to get round in 4 hours. Same comments as I made about the North course. We enjoyed the course and the greens were perfect. The teeing area was a bit worn and perhaps the markers could have been moved more frequently. The golf buggies needed some attention. Twice we ran out of battery power and we noticed that most buggies had broken windscreens. Some long walks from greens to next tee. Tricky dog legs Tight fairways at times. Playing off the white stakes both courses were a good test of golf . South course was very well presented.Fairly tight in places and proved to be quite a challenge.Some very interestig holes with a good variety of shots required.The views were lovely and the whole experience was very enjoyable. Q – What is the nearest airport for El Rompido? A – The best option is fly into Faro in Portugal and drive. Whilst the transfer will take around an hour it is relatively simple taking the A22 along the Algarve, crossing the Spanish border and into Huelva.